An outdoor pool and rooms with mini-fridges and free Wi-Fi make the Key West Inn & Suites South Haven a convenient rest stop with quick access to I-55 and downtown Memphis. The two-story Key West Inn offers 45 rooms with microwaves mini-fridges coffeemakers and cable TVs. Check your email or update your status with free Wi-Fi. The outdoor pool offers cool fun. A breakfast buffet is provided. Fax and copy services are available in the business center. Pets are permitted. Non-smoking rooms may be requested. Parking is free. 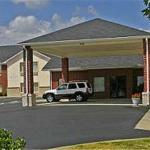 The hotel is located off I-55/69 17 miles south of Memphis. De Soto Center Northwest Mississippi Junior College is a half-mile from the hotel. It's 10 miles to Graceland. Events at Snowden Grove Amphitheater are five miles away. Memphis International Airport is 11 miles from the hotel.